'Mr. Spider' Says Goodbye: An Art Teacher's Final Day At School : NPR Ed For nearly a quarter century, Mathias Schergen taught in one of Chicago's toughest neighborhoods. Now, he's moving on. Mathias "Spider" Schergen in his art room at Jenner Elementary Academy of the Arts in Chicago. 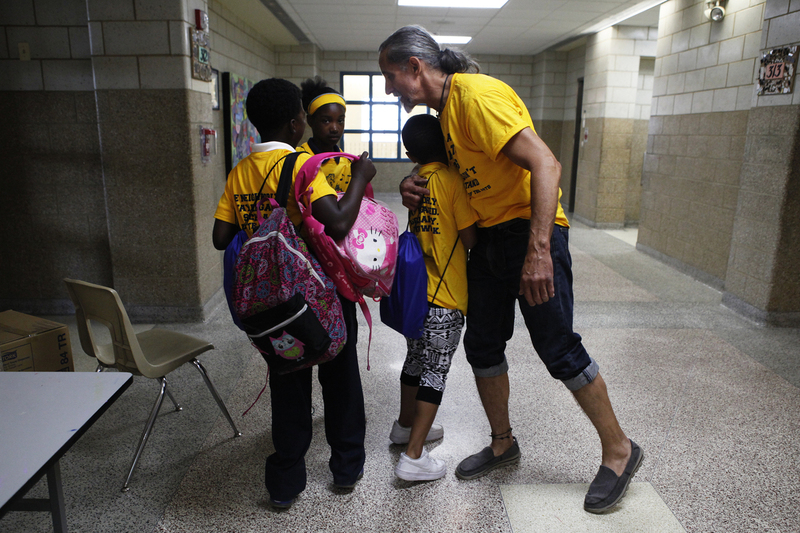 It's a little before 8 a.m. when Mathias Schergen pushes open the side door at Chicago's Jenner Elementary Academy for the Arts. He walks down the hall toward the office to sign in. It's the same routine he's had as Jenner's art teacher for nearly a quarter century. "It's gonna be a good day," a colleague calls out. "It's a good day." They hug. It seems like a typical Friday. Except it's not. After 23 years at Jenner Elementary, Schergen is retiring. "Is this your last day?" asks a first-grader. A self-described child of the '60s, Schergen has a gray man bun and a contagious laugh. Even on his last day, there are still art projects to finish. He's got students cutting wood and painting and assembling a miniature city. Schergen leaves behind a rich legacy at this school. He's won grants for art projects. 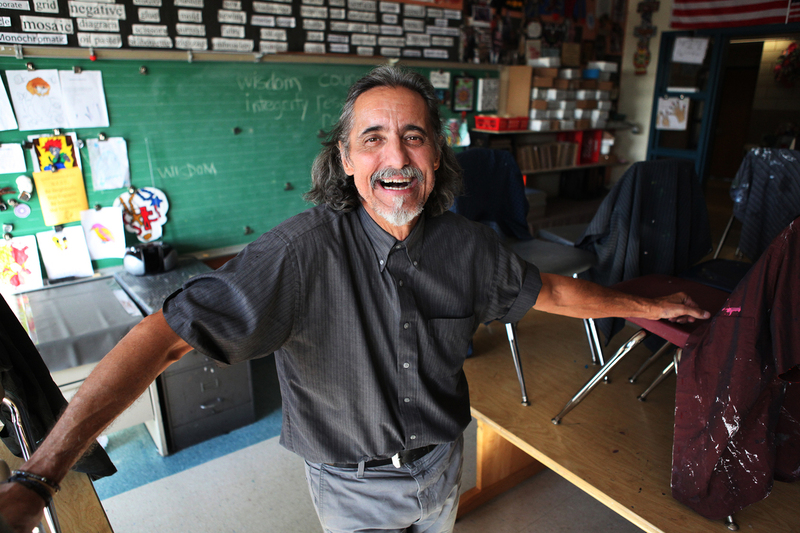 He turned an empty classroom into a museum. He's pushed his students to make art about their lives. 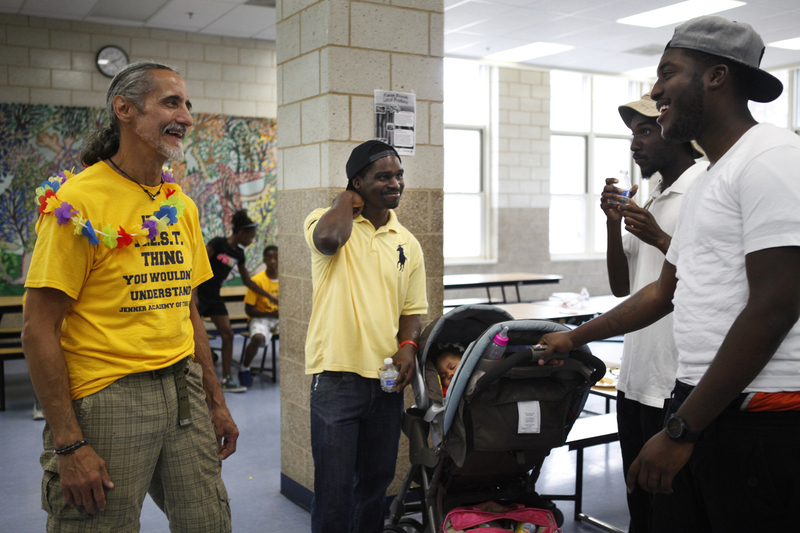 And he was awarded a Golden Apple — the most prestigious teaching award in Chicago. The miniature city students built in Mr. Spider's art classes. 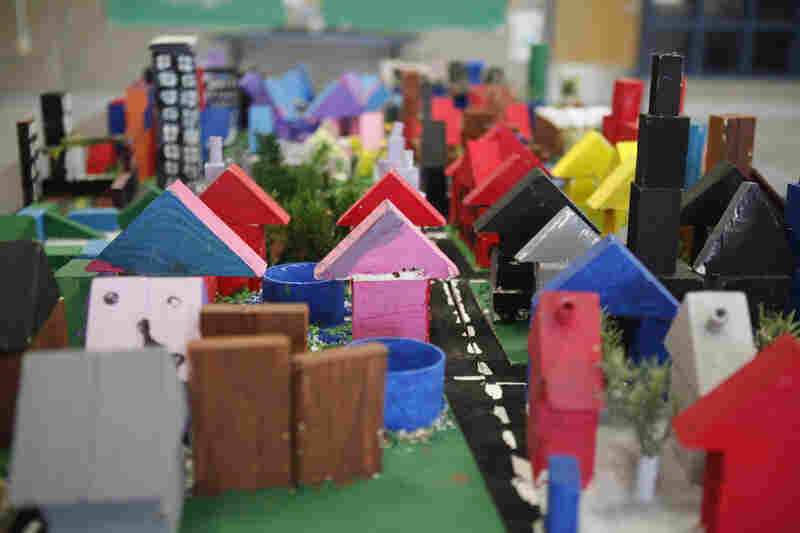 Fifth-graders made buildings out of milk cartons and fourth-graders assembled the city blocks and painted the roads. But it wasn't always easy. For years, Schergen taught in one of the city's toughest neighborhoods, in the shadow of the infamous Cabrini-Green housing project. "When I first got my room I noticed there were bullet holes in the window. That made me nervous," he says. So he stuffed Beanie Babies in the holes to make it "look kinda funny." "I didn't even tell my wife for a whole year," he says. "I didn't want her to know." There were nights he couldn't sleep. The work consumed him. He had trouble just getting his students to listen. Teaching them art turned out to be harder than anything he'd ever done. "I knew within two or three days that I was irrelevant," he remembers. "Any notion on my part that, 'I'm a teacher, I'm a grown-up.' ... Even when I tried, 'I'm an artist. Hey kids, I'm an artist,' it was like, yeah, OK ... whatever." So he learned the lingo and rhythm of his students. He found commonalities — like resilience and the importance of family. But he needed something more. An identity — to connect with his students. So one day he decided: Call me Mr. Spider. "Giving myself a name, Mr. Spider, gave me an out," he says. "It gave me a way to express a side of me I musta had but never took out." It was his own daily performance. The kids loved it. They still do. 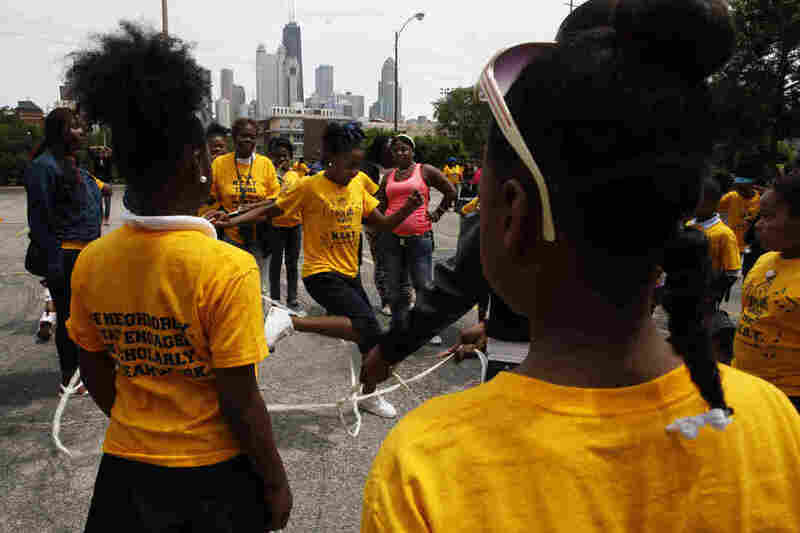 Students practice double dutch behind Jenner Elementary. "His favorite insect is spiders," Adrian Clayton, a fourth-grader, explains to me. "I think his favorite character is Spider-Man." Another student chimes in: "He even has a tattoo of a spider." It's true. He has several tattoos of spiders. In fact, his whole room is filled with spiders. Spider magnets, spider stickers and fake webs with hanging plastic spiders. Ja'Marion Thomas and Kiaerra Moore, both fourth-graders, helped me count all the spiders in the room. We got up to 32, but Schergen insists there are more. The spiders are partially hidden because this room is crowded with artwork. And it's not just this room — the art spills out into Jenner's hallways. After first period, Schergen walks me down to the main floor, where there are bulletin boards of snapshots. "These are 23 years of portraits," Schergen says, scanning the faces. So many stories, stirring up memories. "A lot of these kids [are in] prison or shot or they're not around anymore," he says. But for the ones who are still around, word has gotten out about Mr. Spider's retirement. All day, parents, past students and old student teachers stop by Jenner to say goodbye. "I will never forget that man, like ever," says Mike Allen, a 2002 graduate of Jenner. He's now 26. "I never knew that I could draw or sketch until this man showed me how," he says. Schergen chats with past students. Students credit him with keeping them on track and "putting a smile on our faces." Allen says he was bullied at Jenner and Mr. Spider was there for him. "The only thing on my mind [was], what we gonna do in this man class? Because for real, man, he put a smile on your face, man." With one hour to go, Schergen stacks the chairs and sweeps the floor. He cleans out the sink, for the last time. "Every day I had to wash the mixing trays," he says. "How many mixing trays have I washed in the last 23 years? I really can't imagine." 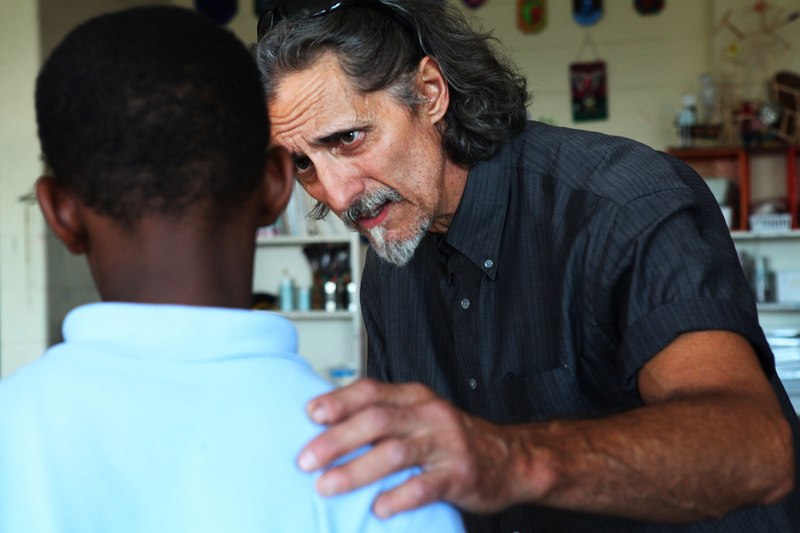 Schergen talks with one of his sixth-grade students. Schergen is absorbed in the ritual, but not for long. Fifth-grader Deontae Barnes, one of his best helpers, has watched him say goodbye all day. He lingers in the doorway. "Ah, come here, son," Schergen says, motioning him over. He bends down for a hug. "Thanks you for making these last days special and being a help to me." When Deontae leaves, I ask Schergen: When your kids ask why you're retiring, what do you tell them? "I just tell 'em that grown people have dreams too," he says. "I have other things in my life I have to do. It's time. It's just time." And that time comes around 3 p.m. Schergen packs up his oversized tote — embroidered with the letters ART — and heads down to the office to punch out one final time. On the ride home, he shakes his head, struggling to stay in the moment. "This is real. This is really happening," he says. "This is really life." He pauses — looking out his window as the new condos of Chicago's North Side fade into the concrete landscape that cradles I-90. Schergen gives out hugs on his last day at Jenner. We ride the rest of the way home in silence. As we drive, I can see Mr. Spider slipping away as Mathias Schergen gets ready for his next chapter.